Portage Bay is happy to help promote the work one of our team, Xandon Frogget, is doing with the Pacific Science Center in Seattle. Below you can read about the virtual reality project they built in Unity, a cross platform game engine. How might this relate to FileMaker? As a FileMaker developer at Portage Bay, I am really excited about what can be done now with VR in Unity. If you are interested in combining Unity and FileMaker, then checkout my tutorial on integrating Unity using the FileMaker Data API. Anything in the virtual world can be conjured from data in FileMaker. From something as simple as visualizing inventory, to something more complex like trying on different outfits. 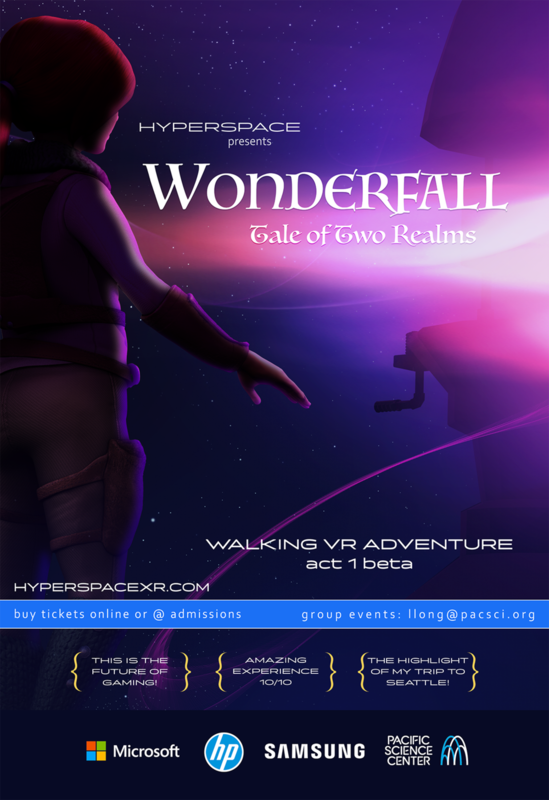 Please enjoy the blog post below about Wonderfall: A Tale of Two Realms, that I worked on with Hyperspace XR, and was built in Unity. Imagine experiencing a story from inside the story world. To freely walk in that world and interact as though it were real. Those were the ambitious goals for a new type of VR experience I had the opportunity to work on at the Seattle Pacific Science Center. It was incredible. 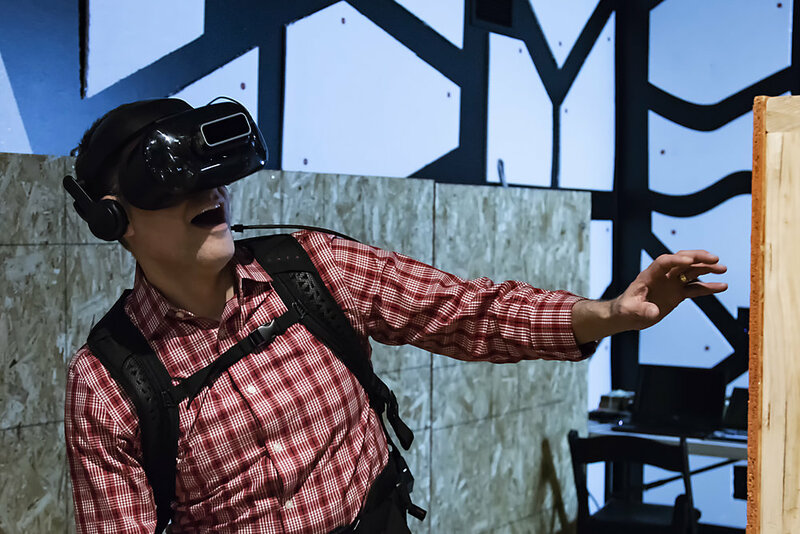 The company, Hyperspace XR, a startup in residence at the Science Center, has big dreams of creating something really cool in VR. It set out on a journey to create a world that is virtual and yet in sync with the physical world. One where they could tell stories and share experiences, and let you, the user, interact in a whole new way. You put on a backpack with a VR headset and you are transformed into another world where you walk through a land of adventure. No controllers, just your hands. You freely walk in the virtual world without tethers or cables to hold you back. A story unfolds as you progress along the journey and you have the freedom to interact with the world. You see a virtual approximation of your hands, and as you reach out, you can touch the virtual world. It was recently coined as a 'Walking VR Adventure'. One of the great parts about having this experience at the Science Center is that we were able to share the building of the experience with anyone who had a few extra minutes and wanted to see what we were building. When I had first started working on the team, in early march 2018, the experience was a rough cut. The script for the experience had been written and many of the pieces, like music and character voices, were just getting started. There had only been minor positioning of prop assets and the characters weren't yet flushed out. Flash forward to this past week ( 9 months later ), there is a village where the story starts, and it feels like a real place. The shops and furnishings are now real and you get to experience them as we put on the finishing touches. Over the past few months, regular visitors to the Science Center would get to see the scenery and the game as it slowly changed and blossomed. As the artists worked to build the world, characters got animated, and sounds made their way into the experience. We would run demo's for anyone who wanted to check it out. I will be honest, it wasn't easy. We were constantly building demo's to test the new things that had been added. Eager to share the next cool piece we had conjured up. Sometimes there were problems and things didn't work as planned, some things backfired, and other times, they worked better than expected and we found new ways to tell the story and explore. Through it all, it was great to get the feedback from users as we tried different things to find out what they liked. While I won't share any spoilers of the story, the hardware is top of the line, partnering with HP, Samsung, and Microsoft has given Hyperspace XR a huge advantage in developing the experience. Hyperspace XR is using the latest that technology has to offer in both the headset and backpacks. Getting the hardware right has been key, and pairing solutions to provide a great experience is the top priority. From the high quality AMOLED screens of the Samsung Odyssey, to the lightweight HP backpacks, they work together providing optimum comfort and emersion. Did I mention the hand tracking? Currently the best solution comes from Leap Motion. Once you start touching the world with hands instead of controllers, you don't want to go back. It is so cool to have hands in VR! As far as physical aspects to the environment, the real world has been carefully aligned with the virtual world so that you can touch physical objects in the virtual world. Walls have been created that have stone facades that align with the virtual stones. The cobblestone ground matches the cobblestone in the game. Many different sensory special effects have been added to convince you that when you see a fire you feel the heat and smell the burning wood. When the wind blows you feel the breeze, and when the ground moves you feel the earth shift. For developing the first experience called "Wonderfall: Tale of Two Realms" our team is using Unity. Unity is a game engine that bridged the many gaps in such a complex system and has been great to build with. We constantly find ourselves pushing the limits of what Unity has to offer, and are grateful that it can do so many things. While future stories and experiences are not locked into Unity and can be developed in various other 3D Gaming engines, Unity was a good choice as it supports all of the current technology and makes it easy to connect elements. If I have piqued your interest then come on over and give it a try. We just started selling tickets to come try the first 15 minutes of the adventure. While it is running in this beta release, funding will assist with expenses as we work on the next chapter of the story.